Imitation is the sincerest form of flattery. In which case, LS Lowry must be one of the most ‘flattered’ artists around. Gee-up Ginger is a 44.5 x 59.5c acrylic on wood painting by Brian 'Braaq' Shields, signed and dated lower right braaq 78 "Ann". It is estimated at £15,000-25,000 in the Lindsay Burns auction on August 16-17. 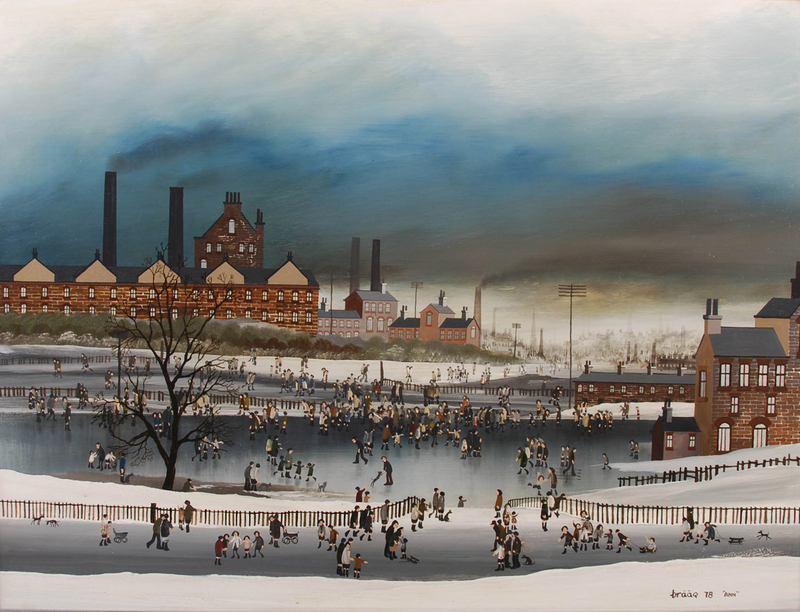 His instantly familiar industrial landscapes populated by matchstick men and women have always had a Marmite quality of love or hate about them. Firmly in the loving Lowry category are the many artists who have been inspired by his views and have produced their own versions. One of the most successful, certainly now in financial value, is Brian ‘Braaq’ Shields (1951-97). He was dubbed the ‘Liverpool Lowry’ for pretty obvious reasons when you see one of his paintings, such as an example coming up at the Lindsay Burns auction in Perth, Scotland, on August 16-17. The colours are a bit brighter and more defined overall, the people are perhaps crisper, but the style is inescapably Lowry. Gee-up Ginger is a 44.5 x 59.5c acrylic on wood painting, signed and dated lower right braaq 78 "Ann". It is estimated at £15,000-25,000 in the Lindsay Burns sale, a price guide reflecting Shields’ popularity among collectors, the fact it comes fresh to the market, having never been offered at auction before, and a strong provenance – all key factors for bidders. Gee-up Ginger was purchased by the current vendor’s father in 1978 for £650 and he had hung it in the family home since. He bought it from the Shepherds Gallery, Windermere, Cumbria, in July 1978. It was on display in the summer exhibition No.10. The auction house say the dated original receipt and a copy of the summer exhibition catalogue page detailing this lot are available. Shields’ work often appears at auction and while a common price over the past couple of years has been around the £10,000-20,000 mark, for his most sought-after pictures prices around £50,000 are not unusual. In March 2014 Ilkley auction house Hartleys sold a view of a racecourse, Does the mean there’s no dinner now, for £56,000, an auction record for an oil painting by him. Art dealers Clark Fine Art, who specialise in Lowry and Modern British art, say in a blog: “As a painter, Brian Shields’ artistic talents did not flourish until an ‘incident’ in a Harrogate Hotel where he attempted to brighten the drab surroundings up with a mural. Signed ‘Braaq’ on account of his artistic nickname at school (a misspelling of the famous French artist Braque ), this caused a stir in the local area as the true identity was sought for this mysterious artist. Shields based many paintings on his childhood memories and they include humorous touches. Born in Liverpool, he spent much of his life in Harrogate.